This watercolor is part a small series of breeds drawn by Oscar Merté (1873-1938). It is a Cob normand. In the beginning of the 20th century the French studs in Saint Lo and Le Pin started to make a clear difference between the Anglo-Norman horse for the cavalry and light harness, and a heavier horse for small farm work. To emphasize the difference the tail of the Cob normand was cut short (‘docked’) and the English name ‘cob’ was introduced. The type is still bred in Le Pin and Saint Lo. 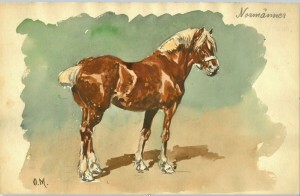 Oscar Merté was an able horse painter who knew very well how to render a certain type of horse. The series consists furthermore of the ‘Araber, the ‘Ungar’, the ‘Engländer’ and the ‘Ostpreusse, Mecklenburger’, all provided with these names in his handwriting. The five watercolors were never published. Next to this series he made a series of ten race horses (‘Rennsport in Zehn Bildern’), but this one was published in a folder. He worked in Munich.